Oil is the Middle East's glamor product, sought after by the entire world and bringing the region wealth beyond the dream of avarice. But water is the mundane resource that matters even more to locals for, without it, they face the horrible choice of leaving their homes or perishing within them. In 1929, the British government, representing East African territories, signed an agreement with the government of Egypt guaranteeing an annual flow of 55.5 billion cubic meters (bcm) of water to Egypt. Counting a minimum of 1,000 cubic meters per capita per annum (the average worldwide is 1,240 cubic meters),* that amount more than sufficed for the 15 million Egyptians of the day. Egypt's water shortfall translates into a need for costly food imports. The succeeding 87 years saw Egypt's population increase six times until today it numbers 90 million. Adding to the river's 55.5 bcm, Egypt gets about 5 bcm from non-renewable underground sources and 1.3 bcm from rain, leaving it with about 62 bcm a year, or one-third less than the country's minimal needs. In addition, Egyptians recycle about 10 bcm of agricultural runoff water, whose highly polluted nature (fertilizer and insecticide residues) eventually kill the land by salinizing it. Exacerbating this shortage, Egypt's high temperatures lead to higher rates of evapotranspiration, requiring more water for agriculture than in places with cooler climates. This water shortfall translates into a need to import food and, at present, Egypt must borrow funds to import an alarming 32 percent of its sugar needs, 60 percent of yellow feed corn, 70 percent of wheat, 70 percent of beans, 97 percent of food oil, and 100 percent of lentils. The need to import will get worse with time; estimating Egypt's population at 135 million in 2050, it will need 135 bcm annually and, based on present assumptions, the water deficit will more than double to 75 bcm. 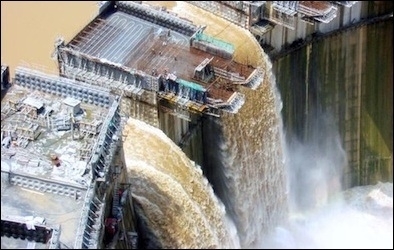 The Grand Ethiopia Renaissance Dam (GERD), under construction, but almost completed, has caused much consternation in Egypt. Making matters worse, Ethiopians recently woke up to the fact that vast quantities of water leave their territories without any benefit to themselves. Accordingly, they initiated a network of dams, culminating with the pompously named Grand Ethiopian Renaissance Dam (GERD). 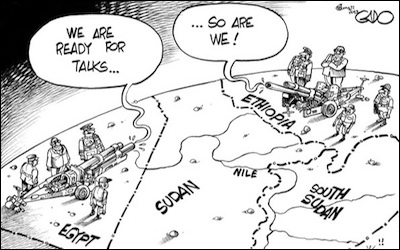 Ethiopians reply: Not to worry, all will be fine, the guaranteed allotment and more will reach Egypt. When Cairo protests nonetheless, Addis Ababa agrees to one study after another, even as it furiously builds the GERD, which is scheduled to begin operations in 2016, storing an initial 14 bcm. Resolution requires creative compromise, allowing the Ethiopia to benefit from its waters without Egypt facing cataclysm. The potential for disruption is enormous; in 2013, during the Mohamed Morsi era, Egyptian politicians inadvertently bruited in public their military plans about special forces, jet fighters, and rebel groups to deal with the GERD (shades of the opera Aïda). Morsi now sits in jail but such ideas offer insight into Egyptian desperation.